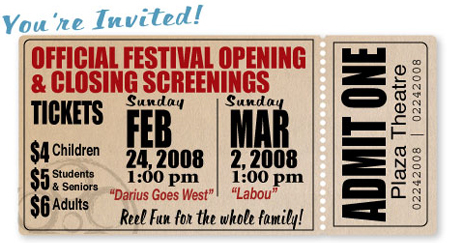 Thanks for making the 2008 edition of the Reel Fun Film Fesitval a resounding success! One of the most popular parts of this year's festival has been the introduction of Film Making Workshops in co-operation with The Director's Cut where students were able to make their own short films and learn about Animation, Claymation and Documentary filmmaking. Welcome to the 2nd Annual Reel Fun Film Festival! We are again thrilled to present an extraordinary selection of films - many of which we are premiering at RFFF!!! These films are guaranteed to engage, entertain and educate students, teachers and parents alike.We also have added a new dimension to our festival and that is our film making workshops. Please click the Workshops tab for more information. You're invited to our Canadian Premieres at our Official Opening & Closing Screenings of the films "Darius Goes West " and "Labou" at the Plaza Theatre. Tickets available at the theatre, or click here for more information. Note that all school screenings are open to the public for attendance - public screening ticket prices apply to non-school participants. We are excited to offer a great lineup for students grades K-12 showcasing quality curriculum linked films that will provoke discussion and will promote students to go beyond the classroom and experience stories and issues from around the world. Please take a look at the filmaking workshops for grades 4-12 here.